User Stories are most often associated with iterative processes and were originally defined by Extreme Programming techniques. They are now more commonly associated with a number of Agile processes. A User Story typically consists of a simple statement made in a few short sentences describing what the user does or needs to do to achieve a goal and why the goal is important to them. They are typically written to replace detailed traditional requirements and allow developers to understand the goals of a user and what their job functions entail. User Stories are useful as an alternative way of describing user requirements. They are used as part of certain Agile processes, to provide a simple but clear description of what the user does or needs to do as part of the role they perform. They also typically describe the reason behind the goal the user wants to achieve. 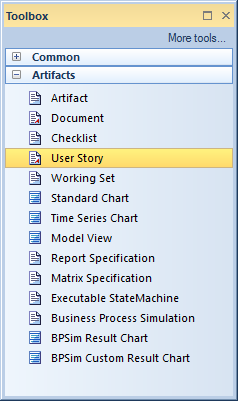 A User Story can be created using the stereotyped Artifact available from the 'Artifact' Toolbox page or as a stereotyped Use Case. While many proponents of User Stories see them differently to Use Cases, they are both aimed at defining a goal that a user in a role wants to achieve. 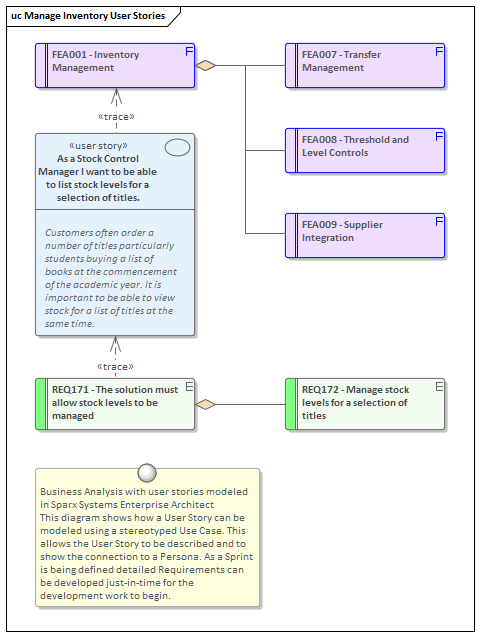 A stereotyped Use Case can also be used to represent a User Story with just the description written in the form: 'As a (Stock Controller) I want to be able to... '. They can be defined in conjunction with Personas that help to allow analysts to empathize with the users.